vomiting (contraction of the abdominal muscles with relaxation of the cardiac sphincter of the stomach and of the muscles of the throat) elicited by a variety of stimuli, especially one applied to the region of the fauces. Contraction of the abdominal muscles with relaxation of the cardiac sphincter of the stomach and of the muscles of the throat elicited by a variety of stimuli, especially by a stimulus applied to the region of the fauces. Emesis (contraction of the abdominal muscles with relaxation of the cardiac sphincter of the stomach and of the muscles of the throat) elicited by a variety of stimuli, especially one applied to the region of the fauces. 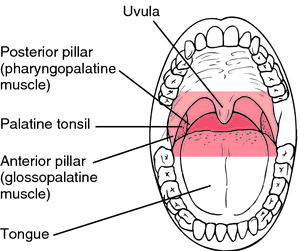 Synonym(s): pharyngeal reflex (2) . Vomiting elicited by a variety of stimuli, especially one applied to region of fauces. Selection of a particular type of drug therapy can be facilitated by an understanding of the essential anatomy and physiology of the vestibular system and the associated vomiting reflex. The area of the brainstem known as the parvicellular reticular formation (PCRF) is believed to function as the vomiting center, where the vomiting reflex is initiated and coordinated. 2) Anesthetic agents initiate the vomiting reflex by stimulating the central 5-H[T.
Netupitant is a highly selective NK1 receptor antagonist, an antiemetic that works by blocking the action of Substance P, an endogenous neurotransmitter contained in high concentrations in the vomiting center of the brainstem that can stimulate the vomiting reflex. The vomiting reflex is integrated in the medulla after receiving carefully timed visceral and somatic components.